Why is Wheatley not on the U.S. News and World Report “Best High Schools” List? On 11 May, US News and World Report published its annual “Best High Schools” ranking list. Within hours of the list being posted, some inquiries were made to my office regarding Wheatley’s omission from this year’s list. Community members were understandably concerned that omission from this year’s list might indicate that something dramatic had changed at Wheatley. This is particularly true given that in its previous six years of ranking, US News has consistently rated Wheatley as a “Gold Medal” school — one of the top 500 high schools in the country. Sure enough, a quick search of the list revealed that Wheatley was not ranked. This was puzzling to me. As I mentioned, Wheatley has been consistently ranked as a “Gold Medal” school. 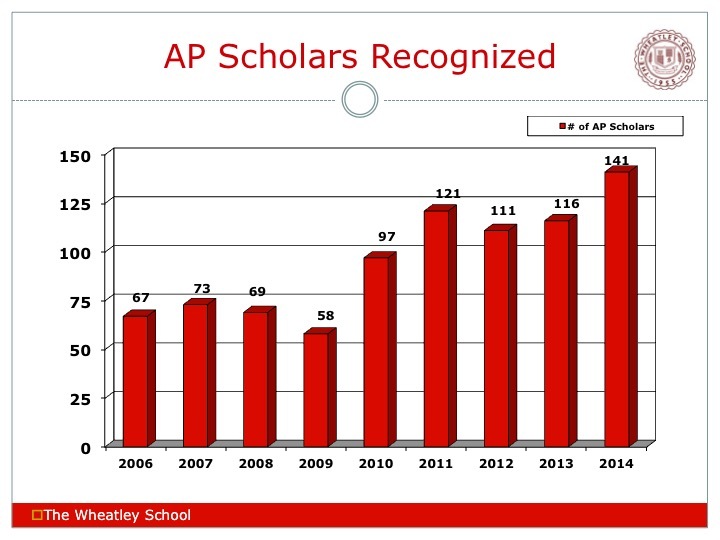 For the 2012-13 academic year (the year on which US News based its rankings), Wheatley students continued their exceptional performance on state-wide examinations and on the accountability measures used by New York State. I soon learned that another high-performing school was not ranked this year: Rockville Centre’s South Side High School. We quickly began working together to get to the bottom of this situation. Before continuing, it is important to understand the ranking methodology used by U.S. News. In order to be ranked, schools must pass through a three-step process. The first two steps of this process involve comparing the school against other schools in its state. Schools that make it through these first two steps are then measured against each other (nationwide) using participation and performance on AP or IB examinations. Step 2: Compare school outcomes for disadvantaged populations against State outcomes for the same populations. Step 3: Compare participation in and performance on AP or IB examinations. After several email exchanges with the data technicians at U.S. News, I was informed that Wheatley was not ranked because it did not make it through Step 1 of the process. That is, according to their metrics, Wheatley’s performance did not surpass the expected State performance. Let’s take a look at why this appears to go against what we know about how Wheatley has fared over the years. For the 2012-13 school year, the 2009 Cohort (those students who were scheduled to graduate in 2013), demonstrated a proficiency rate of 100% in English and 100% proficiency in Mathematics. (You can view the proficiency data through the following link: 2012-13 Proficiency Rates). These proficiency rates for Wheatley certainly compare favorably to the New York State averages of 81% and 82%, respectively. So it certainly seemed to me that nothing had been overlooked from our point of view. Why, then, was I being informed by U.S. News that Wheatley was not performing above New York State expectations? Might U.S. News have made an error? An email exchange with the folks at U.S. News did not yield any answers. Here is a copy of the email exchange. The more Dr. Burris and I looked into this, the more it became clear that the data technicians at U.S. News were not using treating New York student data the same way they had done in the past (and the same way they did this year in every other state we reviewed). Recognizing that different students move through a school system on different paths, state and federal data are usually organized around cohorts. At the secondary level, the cohort year in which a student belongs is the year in which the student first enters 9th grade (the first year of high school). Students graduating in 2013 are part of the 2009 cohort. School accountability and student proficiency is measured by the cohort, which is recognition that the year in which a student meets a particular standard or passes a requirement is less important than the fact that the student does so within the four years of high school. Unlike all of their past rankings, U.S. News did not use cohort data for New York this year! In doing so, they ignored the New York State definition of proficiency. They also revealed a misunderstanding of the nature of New York’s Regents testing program. When I helpfully pointed this out to them in another email, I was greeted with silence. 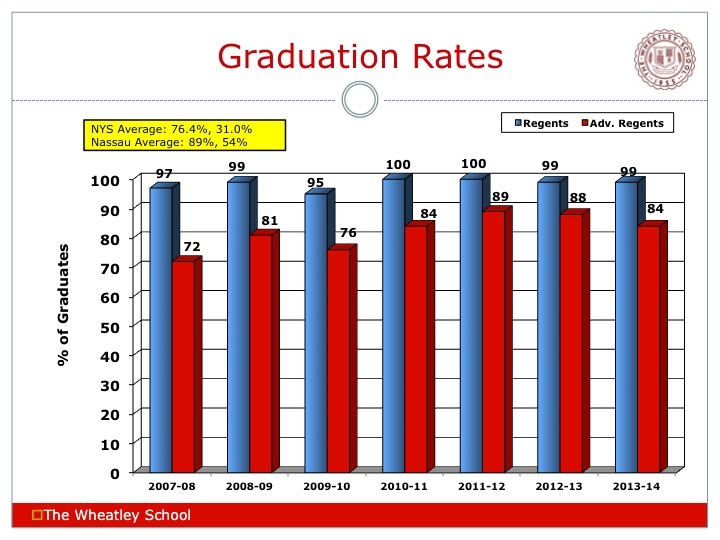 Well…for argument’s sake, let’s revisit Wheatley’s performance on Regents examinations for the 2012-13 year. The failure to pursue an Advanced Designation diploma translates into a much smaller portion of the student population taking the more challenging mathematics Regents examinations. This, in turn, enhances passing rates on these exams—for the “weaker” mathematics students are not encouraged to follow the more challenging path. How does this translate into participation rates on the Algebra 2/Trig exam? In 2012-13, 41.4% of Wheatley students in Grades 9-12 took the Algebra 2/Trig exam; in New York State, that figure was only 14.2% of students in Grades 9-12. Of course, this begs the question: even with these very obvious U.S. News errors, why did Wheatley not make the cut? That is difficult to say without analyzing the data set used for the calculations (a data set that U.S. News refuses to provide). I suspect, however, that it has to do with the fact that the 2012-13 year was the year of our math acceleration “bubble.” That is, this was the group of students who were placed into 8th Grade Algebra as a class. In 2012-13, these students took the Algebra 2/Trig examination for the first time. This June 2013 administration included a notable increase in failures — almost all of which were overcome through summer school or support the following year. Unfortunately, taking a “snapshot” of data in one year does not account for students who go on to succeed in the exam. Additionally, it appears that Wheatley does not get “credit” for the 8th graders who took Regents examinations, for they are not part of the “testing years” as defined by the U.S. News on page 62 of their technical appendix. By the way…given its College Readiness Index (CRI) of 64.4, Wheatley would have certainly qualified for a Gold Medal recognition. As explained on page 18 of the technical appendix, any CRI value above 19.42 earned the school Silver Medal or Gold Medal recognition. Given the CRI of schools on this year’s list, Wheatley would have ranked as one of the top 250 schools in the country. So what will U.S. News do? Well, there is too much money and corporate pride at stake to admit such an obvious error. I suspect that they will issue a blanket response that indicates that these school administrators are incorrect. Next year, they will quietly resume the correct use of NYS data, and both Wheatley and South Side will return to the list. As we should be. And what will we do? We will continue to be transparent regarding our student performance so that our community can be assured that all is well as we continue to make Wheatley a wonderful place to learn and grow. ← Day 1 in Peru for 18 Wheatley Students!